In light of all the talk at work about Jasper Johns and targets, I feel compelled to admit that I love Target . . . the store. 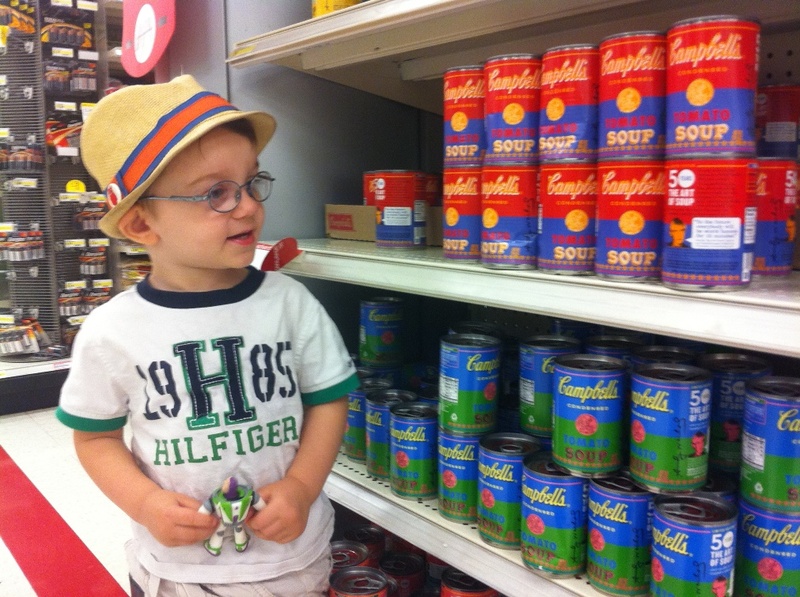 I go there at least twice a week, and on a recent visit with my son, we stumbled across this Andy Warhol-inspired display by Campbell’s Soup. The company produced 1.2 million brightly colored, limited-edition cans to celebrate the 50th anniversary of Warhol’s 32 Campbell’s Soup Cans. For just 75 cents, you can purchase this bit of art and pop culture paraphernalia. But I’d suggest you hurry–when we were there, another shopper was buying a whole case to give as holiday gifts! This entry was posted in Experiment Station and tagged Andy Warhol, Campbell's Soup, target. Bookmark the permalink. Thanks Rolf! I love the Buzz in his hands!